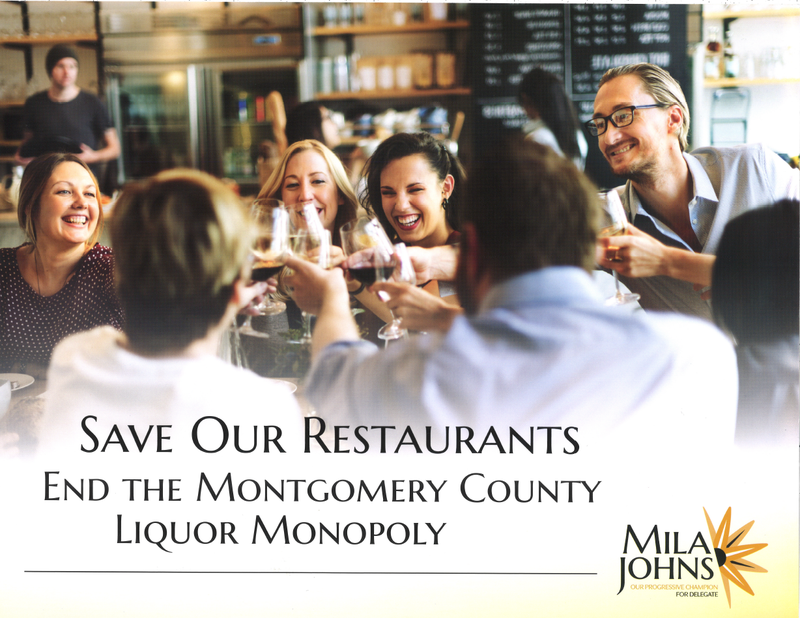 District 18 House candidate Mila Johns has sent out a mailer calling for an end to MoCo’s liquor monopoly. 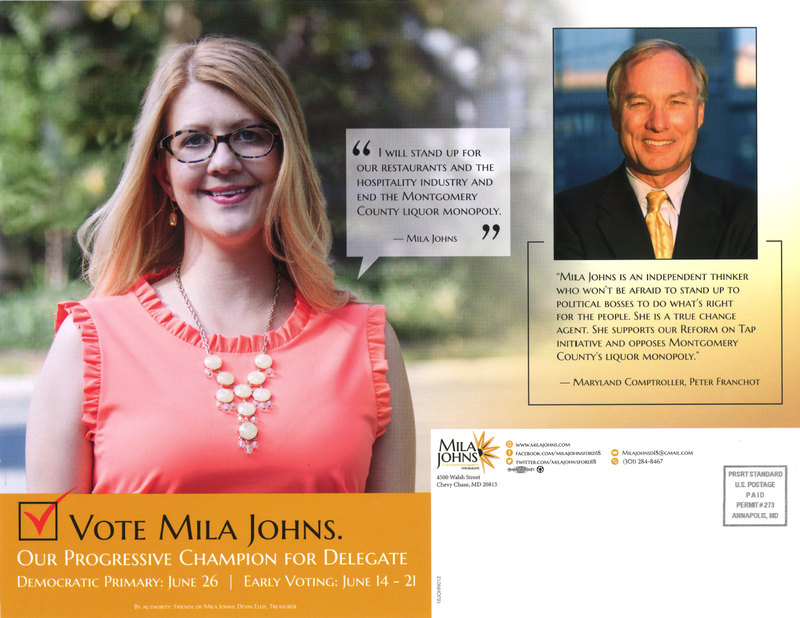 The mailer contains an endorsement from Comptroller Peter Franchot, a hero to monopoly opponents who has been calling for its end for years. This is the first mailer we can recall seeing on this subject and we appreciate Johns’s courage in calling this question so publicly. 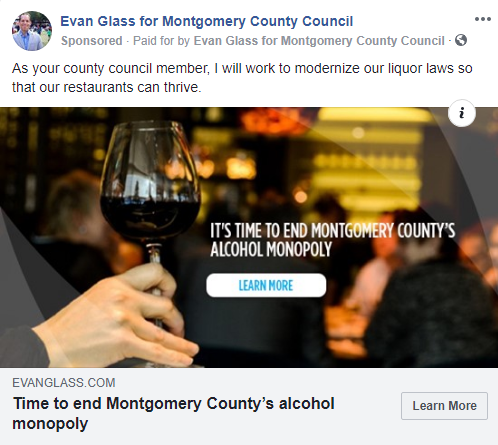 Council At-Large candidate Evan Glass is advertising his position on ending the county’s liquor monopoly on Facebook. In 2014, Glass and Silver Spring restaurateur Jackie Greenbaum co-wrote an op-ed in the Washington Post calling for an end to the monopoly. Is the Liquor Monopoly Improving? Once again, Montgomery County’s liquor monopoly is a hot issue in local politics. As far as we know, MoCo is the only county in the nation in which the county government has a monopoly on the distribution of beer, wine and spirits and also a monopoly on retail sales of spirits. Candidates for office disagree on whether it is needed. In a response to David Lublin’s recent post on the subject, Department of Liquor Control (DLC) Director Bob Dorfman claims it has improved. We will give the monopoly credit for one thing: it did not see system-wide distribution failures in the critical week between Christmas and New Year’s last year as it did in 2015 and 2016. That has not stopped two anti-monopoly groups from forming in the last few months, one representing licensees and another representing consumers. But what’s really going on? Let’s look at the data. According to Gallup and the U.S. Department of Health and Human Services, alcohol consumption tends to be correlated with education and income. That makes sense – people with college and graduate degrees tend to make more money, and people with more disposable income have more money available for alcohol purchases. MoCo has lots of highly educated and wealthy people so we should be one of the leaders in alcohol spending in Maryland. The Comptroller of Maryland, who collects alcohol taxes, posts annual reports of alcohol sales per capita for each of Maryland’s twenty-four jurisdictions on his website. We collected the last ten fiscal years of that data and present it below. Let’s remember when recent changes at the DLC occurred. After many revelations of bad performance in 2014, DLC launched an “Action Plan” to improve performance in June 2015. George Griffin, the former DLC Director who was blamed for the first New Year’s Eve meltdown, left in January 2016, about halfway through Fiscal Year 2016 (which ended on June 30). Bob Dorfman, the new DLC Director, started in December 2016, about halfway through Fiscal Year 2017. If these events were associated with genuine operational improvements, we would expect to see significant increases in both per capita sales and rank among jurisdictions over the last three years. 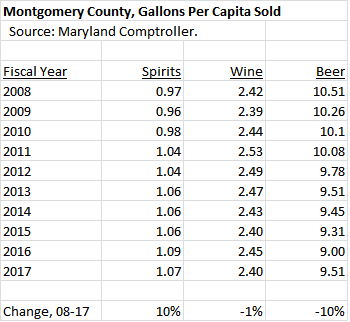 Below is data on per capita sales of spirits, wine and beer in Montgomery County over the last ten fiscal years. Spirits sales per capita have increased over the last decade, although they have barely changed since 2013. Wine is stagnant. Both wine and spirits fell in FY17, the first year of the new Director. Beer sales per capita are down over the last decade and rose slightly in FY17. But here’s the thing: MoCo’s new craft breweries are exempted from the liquor monopoly and, as a result, are doing really well. The tiny gain in beer could be due to FREEDOM from the monopoly, not better operations at the monopoly. Now let’s compare MoCo’s rank in per capita sales to the 23 other local jurisdictions in Maryland. Because of its education and wealth, MoCo should be one of the leading counties in per capita alcohol sales. It’s not. In terms of spirits, the only county that’s worse is Somerset, which perhaps not coincidentally has its own monopoly on spirits sales. In terms of beer, MoCo is dead last. In terms of wine, MoCo has slid from ninth in the state to fourteenth, moving down a spot in FY17. Jurisdictions in which residents bought more wine per capita than MoCo in FY17 included Anne Arundel, Baltimore City, Baltimore County, Calvert, Carroll, Cecil, Frederick, Garrett, Harford, Howard, Kent, Talbot and Worcester. Does anyone believe that residents of counties with two-thirds of MoCo’s household income (or less) drink more wine than we do? What’s happening is that consumers leave the county to buy alcohol. That’s why numerous D.C. liquor stores are located within blocks of the MoCo border. That’s why a fifth to a quarter of customers at Total Wine stores in McLean and Laurel come from MoCo. The state’s Bureau of Revenue Estimates found that if MoCo customers were to return to the county to shop for alcohol in the absence of the liquor monopoly, the county would see a surge of almost $200 million in new economic activity, enabling a path forward for the county to replace every cent of lost revenue. Dorfman is a better manager than his predecessor and we believe he is genuinely trying to improve DLC. But Dorfman won’t be there forever and DLC has a long history of problems. The monopoly also has a long history of promising improvement, mostly resulting in fleeting or ineffective fixes with quick relapses. Even modest liberalization passed by the General Assembly to allow some private retail sales of spirits has been blocked. What the above data on per capita alcohol sales shows is that, despite claims to the contrary, not much has changed. And unless MoCo starts behaving like a normal county and allows private sector competition, true change may never come. Delegate Bill Frick (D-16), who is running for County Executive, is distributing this anti-liquor monopoly glass insert in Bethesda. Frick authored a bill to allow voters to decide whether to the end the monopoly two years ago and is running on that issue in this campaign. People would be a lot less sympathetic to the idea of protecting liquor store or distributor employees. Why on earth should we maintain an antiquated, inefficient monopoly to protect their jobs but not spend money to protect the grocery store cashier or bank teller threatened by automation? What makes all the angst about losing “good union jobs” even more galling is that private liquor distributors are unionized by the Teamsters – a little fact that never seems to get mentioned in all the handwringing. Sadly, no one seems concerned about all these Teamsters Union jobs lost due to the monopoly depriving them of a livelihood. Not to mention the restaurant jobs lost because of extra costs that make it harder to turn a profit and frustration with the Department of Liquor Control that stops businesses from opening or expanding in Montgomery. The other unasked question is why does the DLC perform so poorly if these jobs are so great? Service at DLC stores is variable at best and most employees are unfamiliar with their product. Beyond the stories about the DLC failing to deliver product at key moments, such as right before New Year’s, I’ve also heard about the DLC dumping shipments in the middle of the bar during happy hour. It’s not as if the DLC is understaffed. Somehow, Montgomery County-based Total Wine manages to keep in stock and much better organized a far greater range of product. They do it with fewer employees who yet also seem to know about the product that they’re selling and are more likely in my experience to provide good customer service. Other stores do the same. Similarly, I’d like to know the share of DLC workers who live in Montgomery County. While some might argue that this is irrelevant, why must Montgomery County citizens keep in place a costly system to subsidize workers who don’t even live here? Even this question has totally lost the plot as government should not be a make-work program but should provide services to residents. Councilmembers defend the DLC because it brings in money to the county. It would be a miracle if a monopoly on booze in the DC area did not. The sad truth is that it brings in far less than it might. 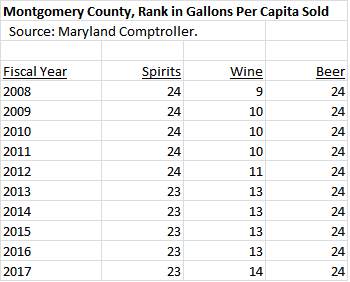 The amount of beer and spirits sold per capita in Montgomery is lower than almost all other jurisdictions in Maryland as well as the Virginia suburbs. Does anyone seriously believe that we drink phenomenally less than people in Fairfax? Greater efficiency would also increase profit. Couldn’t we just tax alcohol and try to grow the economic pie instead of clinging desperately on to a stagnant unloved system? None of this means that we shouldn’t pay county employees decent wages or we should just chuck the DLC workers out of a job. But nor should taxpayers be obligated to maintain a system that doesn’t work and myopically hurts the economy in perpetuity. It’s time to call the question and end this outdated monopoly. 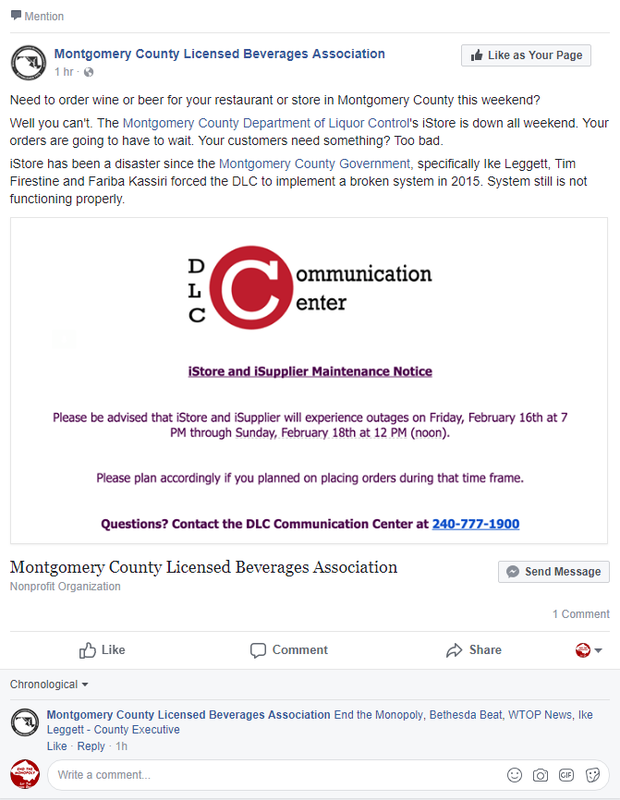 The Montgomery County Licensed Beverage Association, which was founded by licensees as “a voice for Montgomery County retailers and restaurants against unjust DLC practices,” is complaining about a maintenance outage in the liquor monopoly’s iStore and iSupplier ordering systems. This is the second complaint about the monopoly this week after the co-owner of a closing Silver Spring restaurant blasted it as having a “bloated and antiquated bureaucracy.” We reprint the association’s Facebook post, which contains DLC’s notice, below. Source of the Spring has the full statement. In 2015, Delegate Bill Frick (D-16) introduced a bill that would have allowed MoCo voters to decide whether to end the monopoly. An online petition initiated by your author gained more than 2,000 signatures from consumers, retailers and restaurant operators in favor of Frick’s bill. County Executive Ike Leggett and the entire County Council except for Council Member Roger Berliner fought the bill and the delegation declined to pass it. Seventh State asked Frick, Berliner, Council Member Marc Elrich and Council Member George Leventhal, all of whom are running for Executive, for their positions on the monopoly. You can read their responses here. Question: The county’s liquor monopoly has come under heavy criticism–not least from Seventh State. If at all, how would you reform or change, or press the state legislature to change, the Department of Liquor Control? At the county level, I have been the chief advocate for ending our unique – and counterproductive – liquor monopoly. As someone who has fought monopolies most of my professional life, I know in my bones that monopolies are rarely, if ever, in the public interest. Government monopolies are generally even less efficient. And a government monopoly that tries to do a job that the private sector does in the rest of the country is almost always less efficient. That is true in MoCo. As a result, our residents vote with their feet. Almost one-third of our purchases of liquor are made outside Montgomery County. Our restaurants hate it. Top flight restaurants have said that they would never come here. Bottom line: our monopoly needlessly perpetuates the reputation of our county being anti-business and anti-consumer and stunts our economy. However, the state is a critical partner in this conversation. It is state law that created our monopoly, and state law must be passed to change it. The positive side of this dynamic is that the state would be the principal, direct beneficiary of increased liquor sales. I would work with the Governor and our legislature to split the savings that the state would derive and hold the county harmless as it weans itself from this monopoly. The dollars are not that significant given that our retail operations should continue to do well – assuming that they can compete! And in the long run, our county will prosper more without the monopoly than with it. Any discussion of the Department of Liquor Control (DLC) must acknowledge that the Montgomery County budget relies on over $30 million in liquor revenue per year. That is no small amount of money, and it supports critical county services, including almost $11 million for bond payments. Nobody who has proposed privatizing the county’s liquor supply has a workable plan to fill the budget hole privatization would create, likely because there is no way to do so that doesn’t create other problems for the state. Privatization proposals thus should not be taken seriously; instead, we should continue to look for ways to make the DLC more efficient and effective than it has been in the past, and to increase sales so that we can increase the revenue that the DLC generates. We’ve already changed the way the DLC is run by bringing in industry professionals, including the director and the warehouse manager, who have improved the operations of the liquor system and brought in a philosophy of continuous improvement. I’ve also encouraged introducing lower markups for more expensive items, which they did, and I’ve supported and will continue to support efforts to help local breweries and wineries sell and distribute their goods. Both the new director and I want to hear and consider other ideas for helping transition the DLC from something that the county has long taken for granted into a professionally run system. In fact, if a private-sector business had a division that produced a substantial profit but was identified as having management problems and customer service issues that prevented it from being more profitable, its most likely course of action would be to change management, work to improve services, and strive for greater profits. That is exactly what we have been doing with the DLC. I have been the state’s leader on fixing this abysmal broken system. My “end the monopoly” effort, helped immensely by the Seventh State’s Adam Pagnucco, fell short in 2016 in large part because of vigorous opposition from the Council and County Executive. We agreed to let the Executive lead a work group on the issue, but that work group served no real purpose other than to push the issue onto the desk of the next Executive. This is a great opportunity. The DLC has value, and I have proposed to ensure that the value stays with Montgomery County by selling off the DLC’s assets, such as its franchise rights to beer distribution, its stores and warehouse, to generate millions in capital dollars that can be spent on school construction. Because the elimination of the DLC will generate millions in repatriated sales and excise tax dollars, I would work with my colleagues in the legislative leadership to help return some of those revenues to the County. Finally, we all know that the work of alcohol distribution will not disappear with the end of the DLC, rather, those jobs will migrate to the private sector and will likely grow in the County as our consumers come home to buy their beer, wine and spirits here. I will work with the private sector distributors and unions to find the best outcomes for current DLC employees as we get the County out of the liquor business. I am willing to entertain serious negotiations with parties who are willing to make a serious offer to purchase the right to distribute beer, wine and spirits in Montgomery County. In FY 2018, that enterprise generated more than $33 million in surplus revenue over expenses to the county’s general fund, of which $11 million was spent on debt service for approximately $100 million in Liquor Control Revenue Bonds, which were issued more than a decade ago to pay for transportation improvements, including the Montrose Parkway. I think we should commission an independent economic analysis of the present value of a guaranteed revenue stream of more than $30 million each year. My understanding is that it would come to hundreds of millions of dollars – more than enough to retire the bonds. I do not think the county should simply give away these valuable rights, which belong to the people of the county. However, serious offers from serious buyers should be considered. Simply giving the rights (and the associated revenues) away would require that the bonds be retired or refinanced through other means. If general obligation bonds were used to refinance the Liquor Control Revenue Bonds, it would reduce the county’s ability to construct new schools and other capital projects by $100 million. In the absence of a serious offer to buy the rights to the entire enterprise, I continue to support the County Council’s 2015 proposal to privatize special order sales of beer and wine. Problems with delivery of special orders comprise the vast majority of complaints from restaurants, but the Montgomery County delegation to Annapolis declined to take up the County Council’s proposal in the 2016 session after County Executive Leggett asked for more time for study. The Montgomery County delegation also declined to take up proposals for immediate privatization or for a voter referendum. Candidates for County Executive who have concerns about the Department of Liquor Control’s shortcomings should remember that liquor laws are made in Annapolis, not in Rockville. I would also support action by the state legislature to allow sales of beer and wine in grocery stores. Beer and wine stores will soon be able to sell spirits under legislation that passed in the 2017 session, which I supported. The Montgomery County Police Department has reported that two men, one of whom worked for the county’s Department of Liquor Control (DLC), were arrested for a series of liquor thefts from trucks parked at the county’s warehouse. The Washington Post and Bethesda Magazine also reported the story. Note that this was not only an inside job but that DLC’s security procedures were so inadequate that the suspects were able to commit eight different thefts before being caught! But neither the Post nor Bethesda Magazine fully examined the history of criminal, unethical and suspicious activity at DLC. Consider these other recent events. 1. In November 2014, NBC4 discovered that DLC employees were skimming booze from deliveries and attempting to sell it to licensees under the table. People inside DLC told NBC4 that the scams had been going on for years. Four delivery workers were fired and another quit after NBC4’s undercover investigation. Yet another worker was fired later. 2. That same month, NBC4 caught DLC employees drinking and driving on the job. Corruption and ethics issues go back a long, LONG ways at the liquor monopoly. In 2001, its Director pleaded guilty to misconduct in office, misappropriating funds and felony theft. A subsequent Inspector General’s report blamed the county for failure of oversight. In 1980, a consultant who found that DLC was steering disproportionate business to a company connected to the County Executive was forced out – by that same County Executive. That incident mushroomed into a major political scandal, complete with secret tapes and hiring abuses, known as “Liquorgate.” All of this is on top of continued poor service for decades including two consecutive New Year’s Eve meltdowns. No wonder consumers flee the liquor monopoly. Next year, elections will be held for County Executive, County Council and the state legislature. Which candidates will stand up against DLC and advocate for ending its monopoly status once and for all? 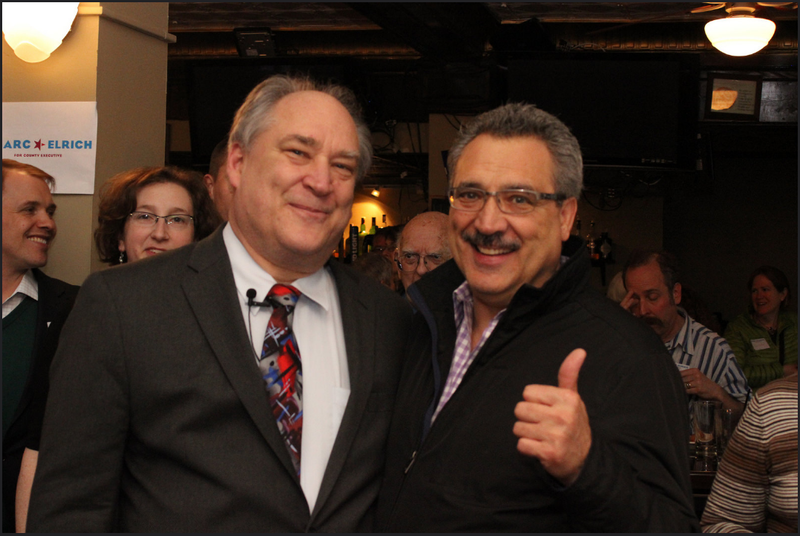 Council Member Marc Elrich held his kickoff event for the County Executive race in Bethesda this past Sunday. One of his guests was Gino Renne, President of the Municipal and County Government Employees Organization (MCGEO), the largest of MoCo’s non-education county employee unions. The picture below says it all. Photo by Kevin Gillogly. More pictures available on Kevin’s Flickr account. Elrich is a beloved figure by many in the local labor movement. He has had support from almost all of the area’s major labor organizations in his recent runs for office. His lead sponsorship of two minimum wage bills has strengthened those relationships. Of specific importance to MCGEO, Elrich was the only Council Member to vote against cutting the union’s negotiated 8 percent raise in the last budget, which also included a 9 percent property tax hike. Additionally, Elrich is a strong defender of the county liquor monopoly, famously accusing anti-monopoly restaurant owners of stealing and whining and then getting banned by one of them. Protecting the monopoly is one of MCGEO’s highest priorities. Gino’s thumbs-up is not an official endorsement. The union has to go through its process, including candidate interviews and questionnaires. But the symbolism of the picture above is hard to miss. Elrich could very well be labor’s pick for Executive.